March 11 is National Oatmeal Nut Waffles Day. It's hard to imagine heartier or more specific breakfast, than the oatmeal nut waffles. Even if you never tried these waffles, we're sure you will love them. Waffles are very popular for breakfast. They are tasty and go well with different kinds of toppings. But if you think that your breakfast can be healthier and heartier, than add some wholegrain oatmeal and any kind of chopped nuts to the waffle batter. 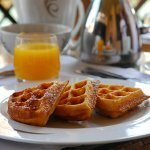 Serve hot waffles with peanut butter or syrup, honey or yogurt and you will have a complete breakfast. We're sure you'd like to know some nutrition facts about oatmeal and nuts. Everyone needs 3 portions of whole grains daily, that is why oatmeal waffles are good for breakfast. As far as nuts are high in fat and calories, adding them to waffles is a good way to limit their portion. All kinds of nuts contain protein and monounsaturated and polyunsaturated fats, but the most heart-healthy ones are walnuts. They contain omega-3 fatty acid and alpha-linolenic acid. But if you must have hazelnuts or pecan waffles, we understand.